Some days...well, really, every day...we tease Homer. He dishes it right back too! One of the ways he is teased is about his magic bean thinking. Having a beautiful milk cow and the delicious options that can be made with her milk, the story of Jack and The Beanstalk takes on a whole new meaning. From our cow we get additional calves. We get high butterfat content milk, so there is plenty of cream for coffee, to make into butter or ice cream. Soft cheeses, yogurt, drinking milk. Next go round we will also make hard cheeses that need aging. Whey used in place of water in pizza dough and bread. The idea of taking a creature that can produce so much to town to sell is a real head scratcher. To sell your milker times must be impossible. To trade for a few magic beans is unimaginable! There are days when, like any other job, one or the other of us want to quit. Earlier this year it was difficult to separate our herd, and the milk cow was the only one who would climb into the trailer. When Homer said he was taking her to the butcher, I told him that was grounds for divorce, and that in these parts the judge was likely to understand and grant me everything: "your honor, he took a 4 year old, freshened cow to the butcher and made hamburger of her"...why, they would throw the book at him! So the beans. Why anyone would ever consider beans in place of a beautiful, sweet, producing so many options for goodies creature like a milk cow I'll never know. 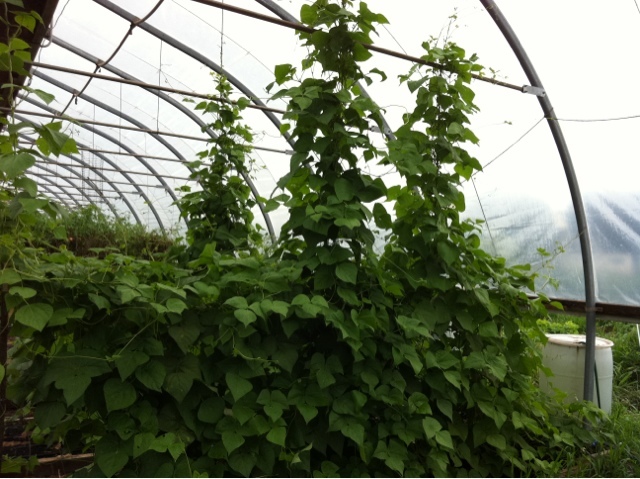 Beans, by the way, are up to the ceiling and doubling back in the hoop house. Not very difficult to grow, and they sure do feel like they could travel right into the sky! But not worth the cow. Ever.